On a bookshelf in my home in a glass-and-brass frame I keep my great-aunt’s Ellis Island health card. It’s cardboard, about as big as your hand. She wore it on her coat during her nine-day journey from Ireland. Every day the ship’s surgeon (possibly brusquely, probably officiously) examined her for signs of acute or long-term illness. 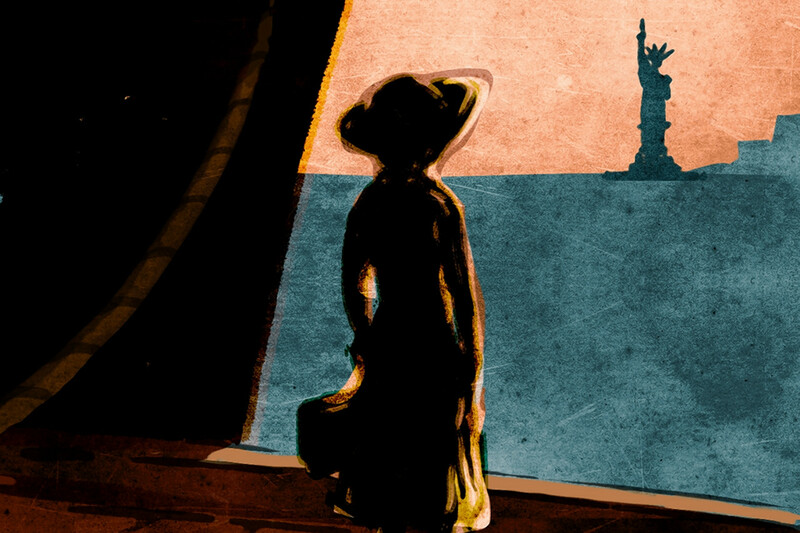 The card noted her details—immigrant, steerage, age about 20—and other facts. SS California out of Londonderry, 1909, Mary Jane Byrne, last residence Glenties. On the back it says, “Keep this Card to avoid detention at Quarantine and in Railroads in the United States.” If she failed the physicals she would be held at Ellis Island or sent back. There’s a little notch to mark each day the doctor found her healthy. In the end there were nine. She disembarked at Ellis Island where, so enraged at this crude, assaultive violation of her civil liberties—being subjected to intimate questioning by a stranger, feeling harassed by the daily threat of rejection and expulsion, being, in effect, immigrant-shamed—she got a lawyer, sued the U.S. government, and, with Emma Goldman and Floyd Dell, started a civil-liberties movement that upended American immigration law. Wait, that’s not what happened! She accepted with grace the needs and demands of her new nation, took no offense, and acknowledged the utility of a quarantine or ban—why would America be bringing in sick people who could spread disease? She settled in Brooklyn near the Navy Yard and became a maid, a job she worked as a true profession, for half a century. Thus was America built. The card she wore on her coat? She kept it as a souvenir. She didn’t know it was a relic of abuse, she thought it was a first palpable sign of citizenship. And so, 50 years later, she passed it on to me. I miss such humility, don’t you? Did we fail to encourage it by forgetting to honor it? Or, if these questions are insufficiently ideological, whatever happened to courtesy to the collective? We should bring it back. We could answer the current quarantine question if we faced it with the calm of a 1909 immigrant. An American nurse returns from Sierra Leone after treating Ebola patients. She did that on her vacation. We are proud of her. After she lands at Newark Airport she is hustled into quarantine. She is greatly shocked and indignant, loudly protests in the media. Her rights are being violated, her treatment is “inhumane.” By that she perhaps meant uncomfortable—a tent, paper scrubs, no shower. It was all on-the-fly and disorganized, a state scrambling to do what the federal government would not. The nurse got sprung and is currently in Maine, refusing quarantine, threatening legal action, and gaily bicycling past media scrums. I see a future in politics. Should she have been quarantined? Of course. Because she is at higher than normal risk of developing and transmitting a deadly virus. She has been tested for the disease, tests came back negative, and she has no symptoms. But—do we need to keep saying this?—the same was true of Thomas Duncan, the Liberian visitor who later developed Ebola and died. As a doctor said, it takes time for the viral load to become big enough to register. The nurse probably won’t get sick—she looks like a person who knows how to protect herself—but why not be careful? The nurse’s case of course makes us think of the New York City doctor who came back from Guinea a few weeks ago after helping people there. He ran all over New York—subways, restaurants, bowling alley—before he came down with Ebola. The New York Post this week quoted law-enforcement officials saying the doctor at first claimed he’d self-quarantined, then admitted he hadn’t. But to be blithely bopping around when he knew he might be carrying a dread illness whose spread would concern an entire city—that was, and I hope I’m not breaching protocols here, discourteous. It wasn’t nice of him to scare everyone like that. It would have been gracious if the nurse, hearing of heightened public anxiety, and concerned for the safety of others, had patiently accepted the situation and expressed understanding. Instead she, and the sick doctor, acted as if, when a microbe meets a respected and altruistic health-care professional, it, like the general public, is expected to bow. Doctors Without Borders suggests those returning from health-care work in West Africa not go to work for 21 days. The military will quarantine U.S. troops back from West Africa for 21 days. Why can’t we have an overall national policy that establishes this? Why are the states forced to do it—then pressured not to? It doesn’t seem to matter if quarantined individuals are at home by themselves, with a cop posted at the front door, or alone in another setting. The only point is that they not endanger anybody. Support among the American public for quarantine appears at this point to be overwhelming. You can know this if you walk down the street and ask people, or if you look at a CBS poll that found 80% of respondents think citizens returning from West Africa should be quarantined until it’s clear they do not have the disease. But America’s “professionals” in the scientific and medical communities, and certainly those in the White House, seem deeply uninterested in the views of common people. When pressed on the issue they, especially the president, offer only gobbledygook and slogans. We can’t be safe here until they’re safe over there! They sound like propagandists for Bleeding Belgium in World War I. The only argument against a quarantine that makes sense is that the decision might dissuade U.S. health workers from going to West Africa. It can easily be answered. Pass a law to pay everyone’s full salary while they’re quarantined. Make it a free vacation. Get them every kind of benefit and service possible for those three weeks. And then when they’re well, thank them publicly. Have them in the balcony at the next State of the Union! Three weeks off and the thanks of a grateful nation. That’s not a disincentive, it’s an incentive. It must be noted that all this—the quarantine argument, the travel ban—is another expression of the deep, tearing distance between America’s professional and political elites, who operate as if they are estranged from common sense, and normal people, who are becoming more estranged from the elites, their oblivious and politicized masters. That distance has been growing all my adult life, but the Ebola argument has brought it into sharper relief. The elites should start twigging onto it. They are no longer immediately respected, their guidance is not reflexively taken. They seem more immersed in political thinking—what is the ideologically enlightened position to take, where’s the boss on it?—than in protecting public health. Or thinking commonsensically, like your great-aunt. Which is too bad because great-aunts built America. All this will be part of the story on Tuesday, in the elections. It is hard to believe you can patronize people, and play them, and they will not, first chance they get, sharply rebuke you.